The Valencia world globe, named after one of the largest cities in Spain, is a new desktop model from the reputable Replogle Globes company. 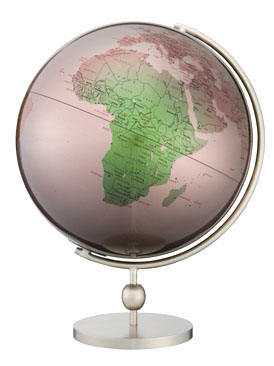 The gleaming, polished surface of the Valencia globe beautifully captures the subtle color gradations of oceans and continents, from warm rosy peach to rich greens and browns. A distinctive addition to any well-appointed desk.